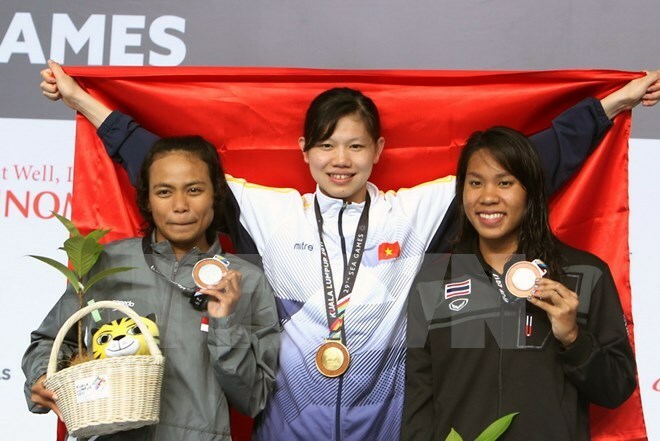 Hanoi (VNA) - As of 10am on August 25, Vietnam remained second in the SEA Games 29’s medal table, with a total 94 medals, including 37 golds, 25 silvers and 32 bronzes. The country was closely followed by Singapore with 34 gold, 32 silver and 34 bronze while hosts Malaysia lead with 63 gold, 45 silver and 38 bronze. Timor-Leste remains rooted to the bottom of the table with no medals, while Brunei and Laos are second and third bottom, both with one silver and six bronze medals. Vietnam sent more than 470 athletes to compete at the region’s biggest sporting event from August 19-31. They are competing in 32 out of 38 sports and aim to bring home 49-59 gold medals for a top three finish.